When you make it your business to get the skinny on Salt Lake's food scene, it's not long before you pay a visit to Curry in a Hurry (2020 S. State, 801-467-4137). Owned and operated by the Nisar family since 1998, Curry in a Hurry was one of the pioneering Indian/Pakistani places in Salt Lake—and it's still one of the best. 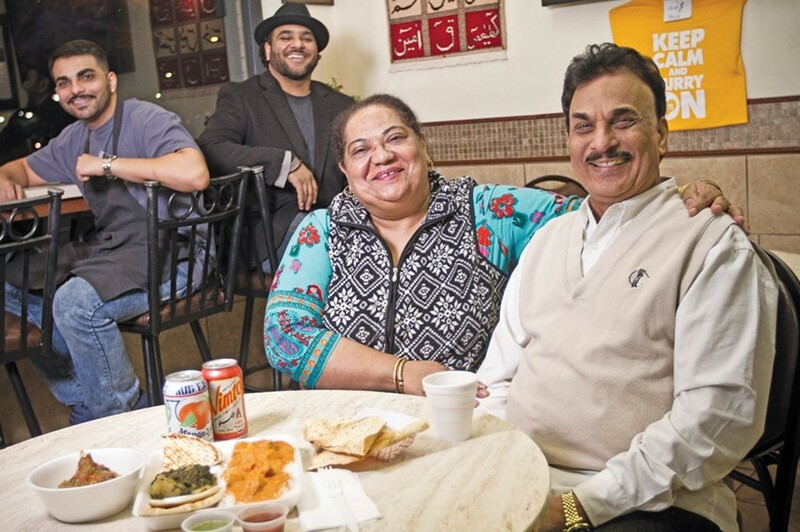 The restaurant got its start after the Nisar family made waves at the 9th and 9th Street Festival two decades ago. Festival attendees were so impressed with Mona Nisar's unique curry fusion—she grew up in Kenya, so her recipe incorporates a bit of regional African flair—that they encouraged the family to open their own restaurant. The Nisars (pictured) took the advice to heart, and soon after the festival debut, they opened Curry in a Hurry at its present location. It's a cozy space—I'd be surprised if more than 25 people can fit in there at once—but it certainly possesses an undeniable charm. Polaroids of the Nisar family members with celebrities like Dave Chappelle and Scott Wolf have been carefully arranged beneath the glass surface of the front counter, and a picture of former Gov. Jon Huntsman Jr. that touts his love for the Nisar's curried potatoes hangs proudly on a wall. As impressive as the gubernatorial endorsement is, my favorite piece of in-house wall art is a photo of Mona and her husband, Rana, that accompanies a list of reasons why the pair opened their family-run restaurant. Among them: They wanted a place that was fast—they don't use the term "hurry" lightly—and nutritious, but also where they could spend time together as a family. Perhaps it's the familial DNA existing deep within the eatery's roots that makes sharing any of their dishes such a warm and pleasant experience. The menu offers only a handful of curries, which, when you consider the restaurant's 20-year timeline, means they're just shy of perfection. My favorite dish is the half-and-half combo ($11.99) because it's a hefty sampling of what the institution has to offer. You can't go wrong with mixing the chicken curry and the lamb korma curry with a bit of curried potatoes. It's all piled high on a pillow of rice and served with naan. The chicken is on the lighter side, and it's tempting to compare it with the Indian staple tikka masala—but that's still a bit of a stretch. The lamb korma is an excellent complement to the curried chicken. It has a darker, richer flavor profile, and the lamb is perfectly cooked. All of the meat used in the restaurant's dishes is also prepared halal, or in accordance with Muslim tradition, which essentially means that diners aren't getting any unnecessary preservatives or hormones with their meat-based meals. If meat isn't your thing, Curry in a Hurry is also a great place to get vegan and gluten-free food—their rotating list of veggie curries doesn't skimp on the flavor. 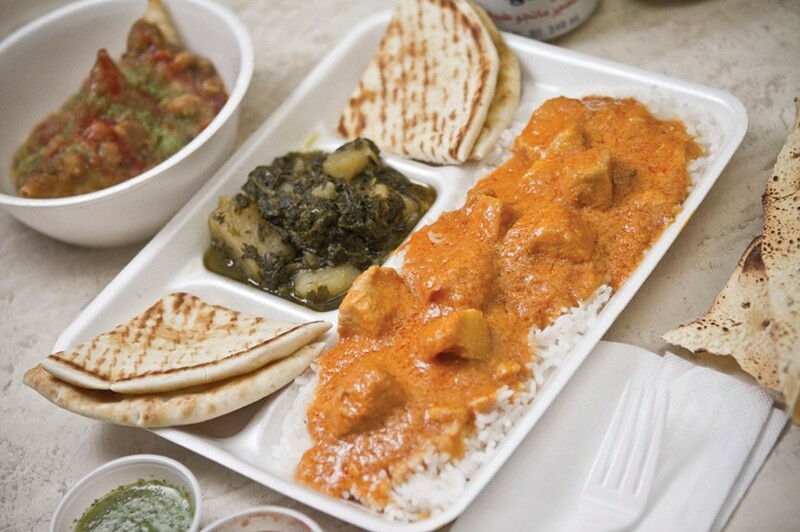 While the half-and-half combo typically satisfies the average curry craving, don't be afraid to expand your horizons with their Mega Combo ($16.99) or Colossal Combo ($24.99), both of which come with every curry on the menu—the Colossal even comes with a samosa, a piece of marinated tandoori chicken, and a sweet yogurt lassi to drink. It's enough food to easily split among two or three diners, and it offers a truly immersive curry experience. One of the gripes I always have about dining out is that there aren't a whole lot of options to get moderately healthy food with the same convenience as the fast-food pantheon. As fast, healthy food done right and done quick is one of Curry in a Hurry's maxims, it's definitely set itself up as an alternative to the burger joints and sandwich shops in the area. I can't think of another Indian or Pakistani restaurant serving up curry that tastes this good this quickly, which is one of the most prominent reasons why Curry in a Hurry stands tall as one of Salt Lake's finest curry stops. Saturday, noon-9 p.m.; Sunday noon-8 p.m.